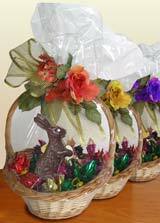 Our Easter Rabbits and Eggs are available for purchase year-round. Click on a rabbit to view larger. Featured for Easter: Chocolate Easter Rabbits and Easter Eggs. All rabbits are shaped on the front side and flat on the back. Bittersweet, Milk, or White Chocolate. 5 inch x 3-1/2 inch. Bittersweet Chocolate with White Chocolate. Create your own custom Easter basket, filled with the chocolates of your choice. We'll place your chocolates in a beautifully decorated basket and ship it out in time for Easter delivery. Call us at 1-866-952-4500 to order.